By the Grace of H.H.Shri Mataji! all Sahaj yogis of the world are warmly invited to please join online collective meditation program from India. 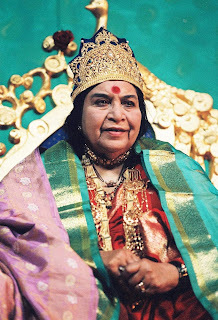 Shri Mataji! YOU are Adi Kundalini (Primordial power) Goddess and our Kundalini is reflection of YOU within us. It's reflection of YOUR power within us and she is our Mother. She gives us Self knowledge. When she rises within us she points out the problems of our chakras, she opens them and relaxes them. She gives us peace and witness state. Shri Mataji! Please Bless us all to be able to grow more and more in our meditation so that our connection with YOU remain strong and we are able to show this path of Kundalini awakening to more and more people.